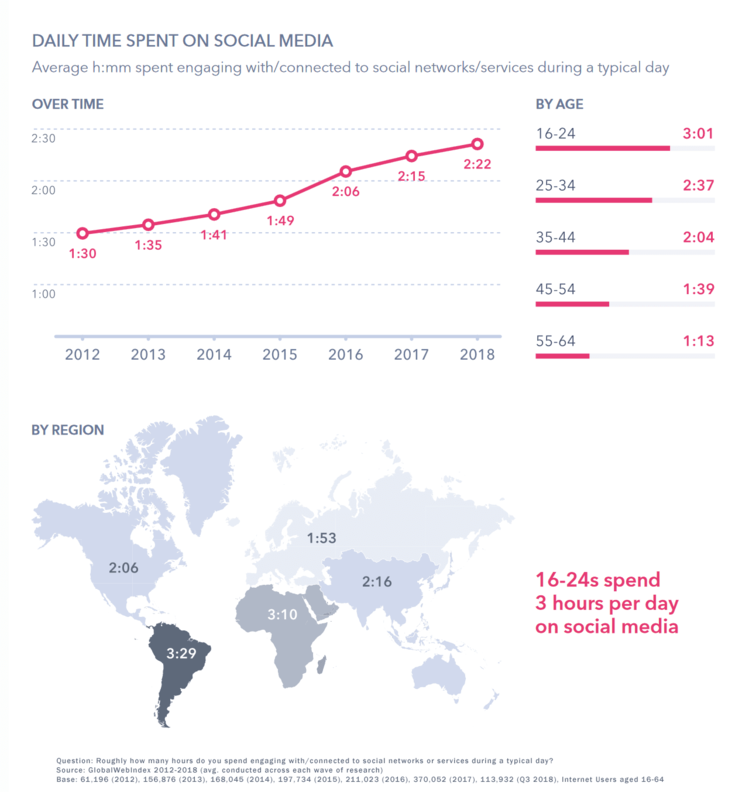 We spend a lot of time on Facebook and other social media platforms every day. We may not like to admit how much, but it’s the truth. Considering that we’re all on social media for at least one hour per day — and I’m not saying which age bracket from above that I fall in — we’re pretty familiar with scrolling through the news feed and what catches our attention (and what makes us roll our eyes). Facebook has been clear that they are focusing on creating positive user experiences and engagement. An interesting byproduct of this focus is that there has been a major trend over the last three years — their revenue per user has doubled, according to Hootsuite. Even more important to know as a digital marketer, that positive user experience is not only for organic posts, it’s critical for Facebook ads too. It can affect your overall optimisations and how much your ads actually cost you. With budgeting for social media advertising expected to double by 2023 according to Hootsuite, it’s time to take control of the ads you’re creating and make sure they convert. When it comes to putting your money where your digital mouth is, how confident are you that you’re saying the right thing, reaching the right audience, and spending your digital marketing dollars wisely with your Facebook and Instagram ads? While creating, managing and optimising millions of dollars of Facebook and Instagram ad campaigns, I’ve seen a lot of mistakes and wasted ad spend. Not to mention, that Facebook continues to evolve at breakneck speed based on what their users like. Let’s talk about what you need to start incorporating into your ads right away. Plain and simple—video is where it’s at right now. Long-format, short-format, super short-format. You name it, viewers are consuming it. Square format is also performing best right now, whether photos or videos. The reason is because the 1:1 ratio takes up more screen real estate—especially on mobile. According to Facebook, videos that are mobile optimised increase brand awareness by up to 67%. Not to mention the added benefit that square images and videos work on both Instagram and Facebook, so you don’t have to split out your placements and ad spend so that you can get the added value of joint optimisation. I love that Facebook keeps testing new formats and developing new format options. Dynamic Creative is an amazing format available now. I am loving this because, in essence, it lets you create rapid-fire tests to quickly see what headlines and copy convert, what size imagery works best, if the audience converts better when they see videos or images, and so much more. Now that we’ve talked about what’s working right now, let’s review some best practices that you should always keep in mind. Over the course of writing, building, launching and managing thousands of Facebook and Instagram ads, I’ve learned that following these rules of thumb can make or break the success of your ads. Be helpful: Don’t let your ad feel like an ad. Use explainer and how-to videos to answer questions and help people understand your products and how you can help them. Be authentic: Don’t use overly staged images or videos. In fact, User Generated Content (UGC) is becoming a big trend to use in ads because the images and videos are real. The end users can more easily relate the ad to themselves when it’s authentic. And shooting your own images or video to feel like UGC is also on-point. Avoid using call-to-action buttons (when you can): They make your ads look like ads! Keep in mind you are required to include a CTA button when using video or dynamic creative. That’s okay, just make sure to follow the other best practices! Square: As I mentioned above, use square format—video, single image, slideshows. Just reminding you! Little or no text: Try to avoid text on images (especially on Instagram). If you do need to use text on images, make sure it is truly necessary to tell the story and keep it to a minimum—definitely under 20% or you’ll get dinged for poor ad performance experience. Here’s a link to upload your image to see if it follows Facebook’s 20% rule. Stay on brand: Maintain your brand look and feel. Remember, and this is crucial, your ads could and should look like they fit in on your page feed. Don’t create ads that look 180 degrees away from your brand feed and grid. Engage with people: They will be asking questions and commenting if you do it right. If people see unanswered comments, they will start to think/know it’s an ad and also assume that your digital customer service is poor. Politely brag: If you have press mentions and awards, use them. They help to give you instant credibility. Be Colorful: Carefully select colors that are on brand and will stand out. It could be a bright color, it could be using a full-color background. If you’re lucky, your product is bright too! Use Captions: Always make sure you use captions. Even if your video ad is only 20 seconds. Many times people don’t have their sound on and you don’t want to waste your ad dollars not getting your message across.